Benjamin-Cummings Publishing Company, 9780805350869, 400pp. For over 23 years, The Anatomy Coloring Book has been the #1 selling human anatomy coloring book, offering concisely written text and precise, extraordinary hand-drawn figures. Organized according to body systems, each of the 170 plates featured in this book includes an ingenious color-key system where anatomical terminology is linked to detailed illustrations of the structures of the body. New Lay-flat binding makes coloring easier. New 8 plates have been added: Accessory Structures of the Skin, Temporomandibular Joint, Upper Limb: Shoulder (Glenohumeral) Joint, Upper Limb: Elbow Joints, Lower Limb: Male and female Pelves, Lower Limb: Sacroiliac and Hip Joints, Lower Limb: Knee Joints, Somatic Visceral Receptors. New 7 additional sections: Skeletal and Articular Systems, Skeletal Muscular System, Central Nervous System, Central Nervous System: Cavities and Coverings, Peripheral Nervous System, Autonomic Nervous System, Human Development. Wynn Kapit graduated in 1955 from the University of Miami, Florida with honors in Business Administration and Law. He then attended Art Center School in Los Angeles and worked in New York as a graphic designer and advertising art director from 1960-66. He moved to California to pursue a painting career and was given a one-man show at the Legion of Honor in San Francisco in 1968. He then attended the University of California at Berkeley and received a Masters in Painting and worked as a portraitist and teacher of figure drawing. While taking a class in human anatomy at San Francisco City College, he discovered a way to effectively learn the subject by coloring in drawings, diagrams and names. The teacher of the course, Lawrence Elson, Ph.D. agreed to help him produce a coloring book. Elson wrote and Kapit designed and illustrated The Anatomy Coloring Book, which was published in 1977 and has been a widely-translated bestseller ever since. The Physiology Coloring Book was published in 1987, with the assistance of two professors from Berkeley: Robert Macey and Esmail Meisami. The Geography Coloring Book was published in 1991; Kapit drew the maps and wrote the text. 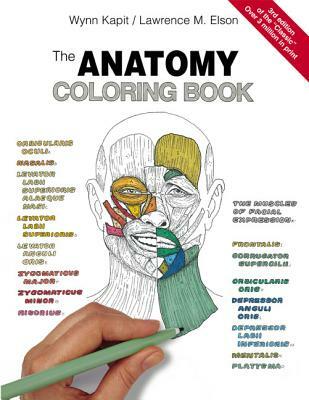 The Anatomy Coloring Book was published in a second edition in 1993, and second editions of Geography and Physiology Coloring Books will be published in 1997. Lawrence M. Elson received his undergraduate degree from the University of California, Berkeley in Zoology (Pre-Med), and completed his graduate and Ph.D. work in Human Anatomy also at the University of California, Berkeley. Elson has served as an instructor in human anatomy at the City College of San Francisco, an assistant professor of anatomy at Baylor College of Medicine, and as a lecturer at numerous additional universities and professional organizations. Elson is the founder and president of Coloring Concepts, Inc. (CCI), producer and packager of college level, educational, scientific directed-coloring texts. He is the author/co-author of the Anatomy Coloring Book, Human Brain Coloring Book, Zoology Coloring Book, and Microbiology Coloring Book. Presently, he is principally functioning as a clinical and forensic anatomist retained as a consultant to governments, provinces, insurance and other corporations, and law firms on causation of injury issues in cases in or anticipated to be involved in litigation. Future plans include expanding CCI by developing new titles in the physical sciences and other education-related disciplines.